At North Seattle College you can prepare for transfer to a four-year school, continue your education beyond an associate degree with a Bachelor of Applied Science degree, or train (or retrain) for a career with an Associate of Applied Science degree or short certificate programs. The college also offers effective college readiness programs and a wide array of continuing education classes to enrich your life. North’s faculty members are well-qualified to share their knowledge. Ninety percent of full-time faculty hold a master’s degree or higher. And North instructors are here because they love to teach and they care about your future. Diversity in North’s classrooms—a cross-section of ages, educational backgrounds, ethnicities and life experience—enriches the college experience for everyone. Learn from the best—when and how you want. Online, on campus, daytime or evening (including the Associate of Arts and Associate in Business evening/hybrid degree programs), or a mix of all. North’s STEM programs (science, technology, engineering and math) have a strong reputation, and students highly endorse the interdisciplinary learning experiences offered through Integrated Studies. North student researchers have been honored locally and nationwide, and the college is a regional leader in nanotech education—with some nano grads earning upwards of $90,000 within the first year of graduating from the program. Train for nursing, EMT, aerospace jobs, accounting, and watchmaking, get studio art skills or learn one of seven languages. 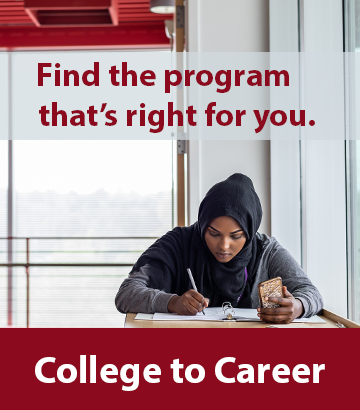 Prepare for your future in high caliber programs and receive strong academic support in person and online through the resources of the Student Learning Center or at North’s Library.